Eris. Ever heard of it? 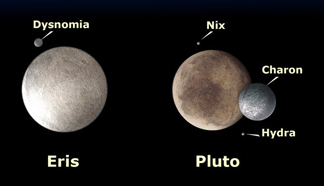 Eris is the reason Pluto — poor old Pluto — is no longer deemed worthy of being called a planet. In the good old days (otherwise known as the Eighties), we learned about the solar system in school. Back in 1986, the reappearance of Halley’s Comet was not treated as a harbinger of doom, but as an unmissable opportunity to foist random space facts onto unsuspecting school aged children that was too good to miss. 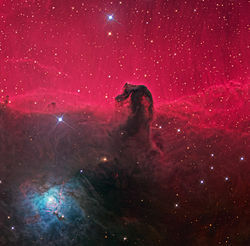 In educational parlance, it heralded the arrival of a “teachable moment” in gloriously action-packed colour, and our lessons were filled with tales of the Milky Way, black holes, quasars, nebulae (the Horsehead Nebula was a particular favourite), red dwarfs, Magellanic clouds and — of course — the planets. All nine of them. Nine planets — just like the Nine Nazgul in Tolkein’s trilogy, or the nine circles of hell in Dante’s Divine Comedy. We even had a mnemonic to remember them, in order of their proximity to the Sun: My Very Elegant Mother Just Sits Under New Potatoes. (Admittedly, like many mnemonics it doesn’t make much sense, but the critical factor here is the presence of Potatoes…er, I mean Pluto…at the end, way out in the darker reaches of the galaxy). But then in the early Nineties, Pluto’s planetary status started to wobble. Astronomers discovered the Kuiper belt, a ring of objects way out past Neptune. Big objects. Dark mutterings began to be heard in astronomical circles, that Pluto — named for the God of the Underworld, no less — was only a dwarf planet. And then, in January 2005, a new body was discovered. And this object, as it turned out, was bigger than Pluto. Yep, you guessed it: Eris. In one fell swoop, Eris — appropriately named after the Goddess of Strife and Discord — sent Pluto packing from the planet list, relegating it to the ranks of TNO’s (Trans-Neptunian Objects) and forcing the International Astronomical Union to come up with a formal definition of “planet” at a conference in the Czech Republic in 2006. And while the cynic in me suspects that all those stargazing scientific types really wanted was a good excuse to visit Prague, the upshot of their Eastern European sojourn was that Pluto was down-graded. Reclassified. Failed to pass the planet test. To say the decision to strip Pluto of planetary status was controversial would be an understatement — even in astronomical circles. Apparently less than 5% of astronomers voted to support the new definition, which could hardly be construed as a representative sample in any dictatorship democracy. I, for one, would agree with Alan Stern, who asserted that “the definition stinks, for technical reasons” (and if you’re similarly inclined, you can read about why here). This image comes from a Northern Arizona University article discussing their involvement in investigating the surface of…you guessed it…Eris. Apparently, Pluto does not meet Criterion 3 of the IAU’s definition of planet: that the object “must have cleared the neighbourhood around its orbit”. I mean, seriously people — is that it? If clearing the neighbourhood is all they needed Pluto to do, surely we could have sent someone out there to sort it out? The US Marines, perhaps? The French Foreign Legion? Hell, I think even the New South Wales Police Force would be happy to take on the task of clearing a neighbourhood. To be fair, I do understand that the IAU had something more along the lines of gravitational dominance and of there not being other bodies of comparable size other than its own satellites in the vicinity — and let’s face it, Pluto is light years ahead of Earth on the satellite front, with five moons to our one. But even when the scientific definition is considered, the celestial finger is still pointing in one direction, and one direction alone: towards Eris. Because Eris is the body of comparable size to Pluto that stops it from clearing the neighbourhood. But now, finally, true believers around the galaxy are being rewarded for our continued faith in Pluto: our favourite former planet is making headlines once again. More than nine years after its launch (yes, nine…there’s that number again), NASA’s New Horizons mission, tasked with understanding the formation of the Pluto system and the Kuiper Belt is rapidly approaching its destination. At the time of writing this, there are less than four hours before the New Horizons spacecraft flies closest to Pluto, when it will be only 12,500km from the Plutonian surface. The images the spacecraft will send back to Earth will be the first we have ever seen — which is arguably the most exciting thing to have occurred on July 14 since the storming of the Bastille in 1789. I can’t wait to see those pictures! Though I would imagine that Alan Stern, the aforementioned Defender-of-All-Things-Plutonic, is pretty keen on seeing them too. After all, he is the principal investigator on the New Horizons mission.